Light-filled Home in Prime Location Darwin Northern Territory Australia. Star rating 5. Average rating 0 off 0 reviews. Chic City Centre Apartment for 4 Darwin Northern Territory Australia. Star rating 5. Average rating 0 off 0 reviews. ZEN TOWERS COZY HOLIDAY HOME For Families in CBD Darwin Northern Territory Australia. Star rating 5. Average rating 0 off 0 reviews. Private Oasis In The Heart of Parap Darwin Northern Territory Australia. Star rating 3. Average rating 0 off 0 reviews. Elsey on Parap Serviced Apartments Darwin Northern Territory Australia. Star rating 3.5. Average rating 10 off 1 reviews. Down Under Hostels on Mitchell Darwin Northern Territory Australia. Star rating 3.5. Average rating 8 off 4 reviews. 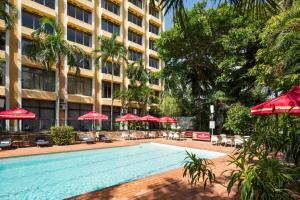 Darwin City Hotel Darwin Northern Territory Australia. Star rating 4. Average rating 7.9 off 42 reviews. 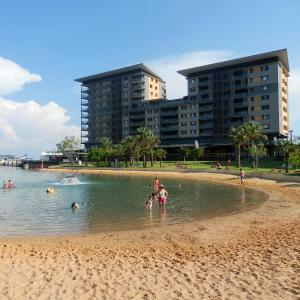 Darwin Waterfront Apartments Darwin Australia. Star rating 4.5. Average rating 0 off 0 reviews. Frontier Hotel Darwin Darwin Australia. Star rating 3.5. Average rating 8.1 off 5 reviews. RNR Serviced Apartments Darwin Darwin Northern Territory Australia. Star rating 4. Average rating 7.8 off 7 reviews. Crocodilly Inn Darwin Northern Territory Australia. Star rating 3. Average rating 7.6 off 17 reviews. Gateway Villa in Palmerston NT (3 bedroom villa) Darwin Northern Territory Australia. Star rating 0. Average rating 9.8 off 2 reviews. Down Under Hostels on Harriet Darwin Northern Territory Australia. Star rating 4. Average rating 7.5 off 51 reviews. Darwin Airport Inn Darwin Northern Territory Australia. Star rating 0. Average rating 7.9 off 17 reviews.